Our most recent post in our monthly topic focused on the character Merlin, and in particular the form of his name given to him by Geoffrey of Monmouth: Merlinus Ambrosius. Having concentrated on the Merlin/Myrddin forms in that post, in this one we now take up the issue of Ambrosius, and its connections to the Welsh name Emrys. Monmouth is the first to give Merlin the epithet Ambrosius, and this element is distinctly non-Celtic: It is a Roman nomen ultimately deriving from Greek ἀμβρόσιος ‘immortal, divine’. The most famous historical Ambrose is the 4th C church doctor Aurelius Ambrosius, better known modernly as St. Ambrose of Milan. While Ambrose was never a popular name, it was used throughout Europe. The use of the name almost certainly is due to the fame of the saint, and not due to the Arthurian connections via Monmouth. Merlin is not the only Ambrosius to appear in connection with the Arthurian myths, nor is St. Ambrose the only historical Ambrosius who has a second name associated with the word aurelius. In the 6th C De Excidio et Conquestu Britanniae, the historian Gildas mentions a 5th C Romano-British war leader Ambrosius Aurelianus; in Welsh histories, he is known as Embreis Guletic (Guletic being a form of gweldig ‘lord’). A 9th C Historia Brittonum, often attributed to Nennius, confuses this person with the boy who became Merlinus, resulting in Monmouth’s conflation of the names into Merlinus Ambrosius . So what about this Welsh form of the name, Emreys or Embreis in Old Welsh and Emrys in modern Welsh [2,3]? We have no non-literary examples of the name used by people in the Middle Ages. 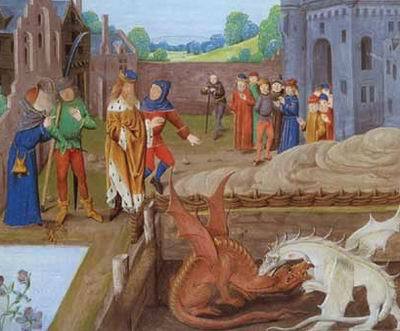 It does show up in a place-name associated with the Arthurian character: Dinas Emrys, a post-Roman hillfort where, according to the Historia Brittonum, a young Merlin prophesied to Vortigern that the white dragon of the Saxons, would be conquered by the red dragon of the Welsh [*]. Hutson, Arthur E., British Personal Names in the Historia Regum Britanniae (Berkeley: University of California Press, 1940), pp. 58, 119. Bartrum, Peter C. Welsh Classical Dictionary (Aberystwyth: National Library of Wales, 1993). Bromwich, Rachel. Trioedd Ynys Prydein. (Cardiff: University of Wales Press, 1978). [*] Many thanks to Dr. Heather Rose Jones for sharing her research on the medieval usage of Emrys. We couldn’t cover names from Arthuriana without covering the name of arguably the most important character, bar Arthur himself: Merlin. 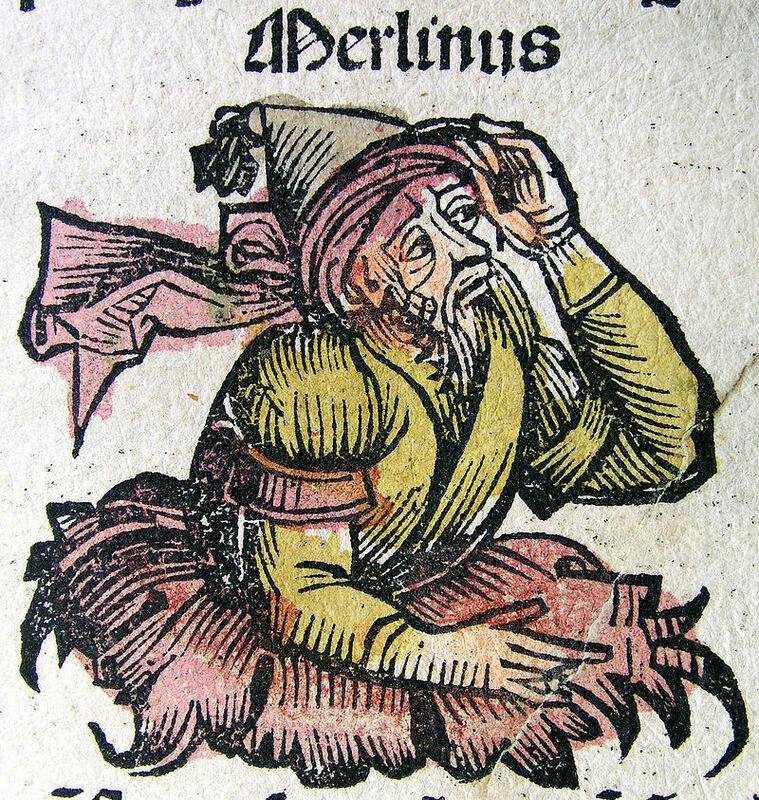 This character owes his existence to Geoffrey of Monmouth, who named him Merlinus Ambrosius (Welsh: Myrddin Emrys). We’ll devote two posts to his name, considering both the Latin and Welsh forms of the first name in this post and then Latin and Welsh forms of the second name in the next post. The fact that Geoffrey connects Merlin with Caermarthen is evidence that Geoffrey is probably eponymizing again . The shift from Merdinus to Merlinus has been explained by Lot as an attempt to avoid an unpleasant association with the French merde, and this seems a good reason . There is little to no evidence that Myrddin was ever used as a personal name as a result of Arthurian influence, before modern times. Merlin, on the other hand, was sporadically used in England in the 13th and 14th C, with examples such as Ralph filius Merlin 1202, Jon Merlini c1210, Henry Merling 1327, and John Merlyn 1347 . By the 14th C, the name had also made it to the Netherlands, in the spelling Merliin . The name can also be found in Germany, but there it is not entirely clear that the Arthurian character is the root. When used by women, Merlin can be a diminutive of Margaret (see this post for a discussion of the suffix. ), and it can also be a derivative of Middle High German merle ‘thrush’. Next post, we’ll pick up Ambrosius/Emrys. Hywel Wyn Owen & Richard Morgan, Dictionary of the Place-Names of Wales, (Gomer, 2007): s.n. Carmarthen. Hutson, Arthur E., British Personal Names in the Historia Regum Britanniae (Berkeley: University of California Press, 1940), p. 59. Reaney & Wilson s.n. Merlin. De rekeningen van de grafelijkheid van Holland uit de Beierse periode, Serie I: De rekeningen van de tresorier en de dijkgraaf van de Grote Waard, Deel: 1393-1396. (Den Haag: Instituut voor Nederlandse Geschiedenis, 1997). Bahlow, Hans, Dictionary of German Names, tr. Edda Gentry (German-American Cultural Society, 1994 ISBN: 0924119357), s.n. Merl(e). We’re also well on our way to the publication of the next edition possibly by the end of the week. With 45,000 citations of over 1850 names, this edition will mark our 1st anniversary. Our first edition had just over 20,000 citations of slightly more than 1,000 entries, so in a year we have nearly doubled in size. Quite the target for next year if we’re to replicate this! The Sword in the Stone competed with Robin Hood for the place of “my favorite Disney movie” as a child, but in The Sword and the Stone, Wart’s foster-father Ector had no competition for the place of “favorite minor character”. He was just so funny! (I think the song “Scrumps” was my first exposure to drunkenness.) His name is the focus of today’s post. 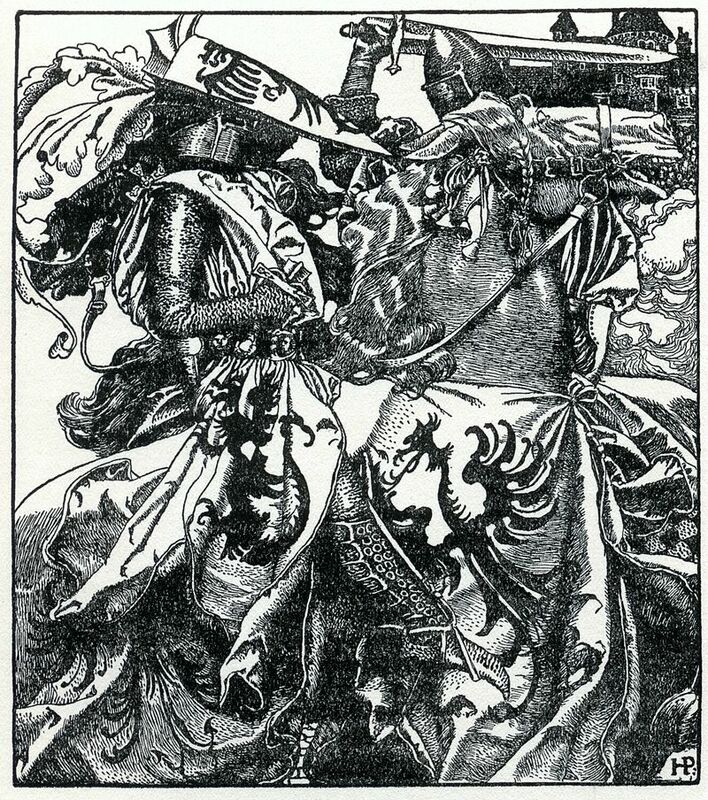 Ector or Hector is the name of two Arthurian characters; in addition to Arthur’s foster-father, there is a younger half-brother of Lancelot known as Ector or Hector de Maris, whose stories can be found in the early 13th C Middle French Vulgate cycle. The presence of this name in the Arthurian legends is a testament to the diversity of the origins of the names. While many of them come from Celtic, usually Breton or Welsh, origins, we’ve already seen one (Lancelot) that is likely of Germanic origin, and others show the influence of the Roman occupation on Celtic Britain (we’ll see some of these in future posts!). Hector adds a new lingual origin to the mix: Greek. The name is identical with Greek Greek Ἕκτωρ, of uncertain origin but possibly derived from Greek ἔχειν ‘to have, hold’. The Greek hero Hector was himself well-known throughout the Middle Ages, accounted as one of the Nine Worthies. As a result, it can be difficult to attribute use of this name medievally specifically to Arthurian sources, since there is good reason to think that many instances of the name harken back to the Greek hero. This is particularly the case with examples from 13th C England and 16th C Italy, both of which periods and places are noteworthy for the fad of reviving classical Greek names. And indeed, it is no surprise we we have examples of Hector in both contexts: In England, we have examples of Hector from 1161×1184 (see the next edition), 1190, and 1222 (Reaney & Wilson, s.n. Hector), while in Italy early 16th C examples can be found in both Rome and Naples, in addition to other examples from the 14th C on. The name also shows up in France in the 14th-16th C, and Germany in the 15th C. It was never popular, but there is no doubt that its use is directly attributable to the legendary figures, both Greek and Arthurian. There are a number of different characters named Elaine in the various stories, including Elaine of Astolat, Elaine of Benoic, Elaine of Corbenic, Elaine of Garlot, Elaine of Listenoise, Elaine the Peerless, and Elaine the Younger. 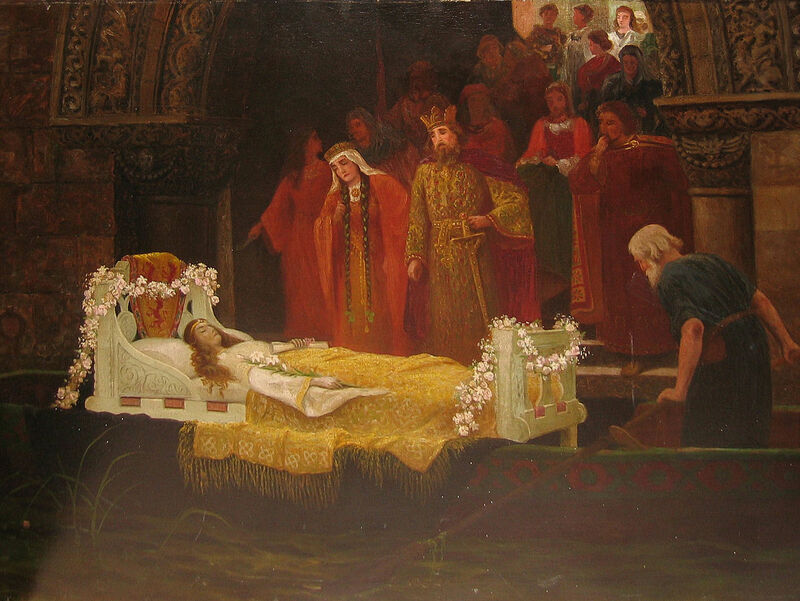 Elaine of Astolat, aka Tennyson’s Lady of Shalott, is probably the best known; her tale is told in the early 13th-century Mort Artu, written around 1210. 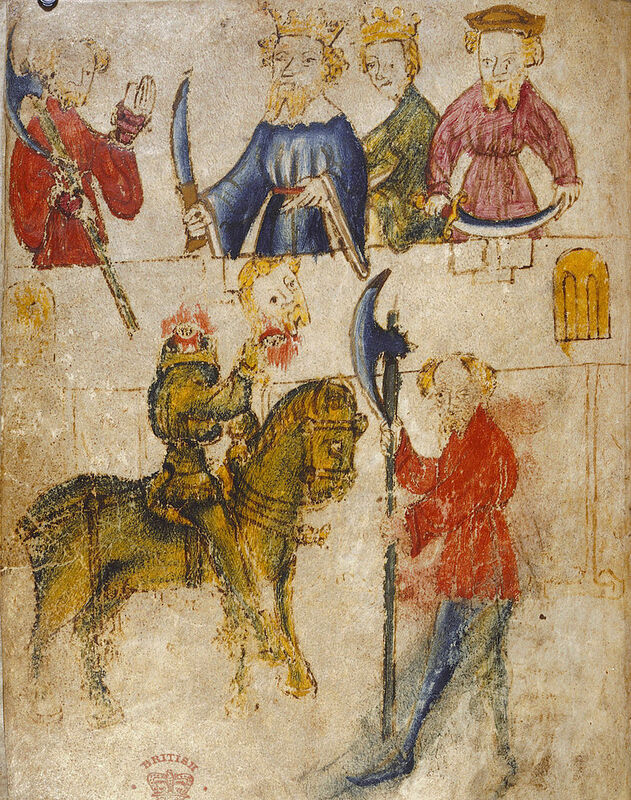 The other well-known Arthurian Elaine is Elaine of Corbenic, the mother of Galahad by Lancelot. Elaine is a form of Ellen, a name which was rare in France before the advent of the Arthurian tales, and was never common even after. The spelling Elaine is not a typical development from Latin Elena; instead, it was influenced by Welsh forms of the name. A 12th century legend identified Saint Helena, the mother of Emperor Constantine, as a daughter of “King Coel of Colchester”, sometimes identified with Coel Hen of Welsh legend. Despite the lack of factual basis for any of these legends, the name was popular in Wales. French forms of the name include, variously, Helaine, Elayne, and Helayne. These -ai- or -ay- spellings are specifically associated with the Arthurian character, as opposed to Latin (H)elena or vernacular English forms such as El(l)en, the use of which probably is due more to Saint Helena than to the Arthurian characters. If we exclude the ‘standard’ spellings and focus on spellings with -a-, we find that, for whatever reason, Elaine’s name was not taken up with the same popularity as some of the other Arthurian names. In particular outside of France, the only -ai- or -ay- spelling that we have is Elayn, which is found in Latin contexts in Suffolk in 1381. Taking a request from the audience, in this post post we consider Gawain, the name of a son of King Lot of Orkney and a nephew of Arthur. 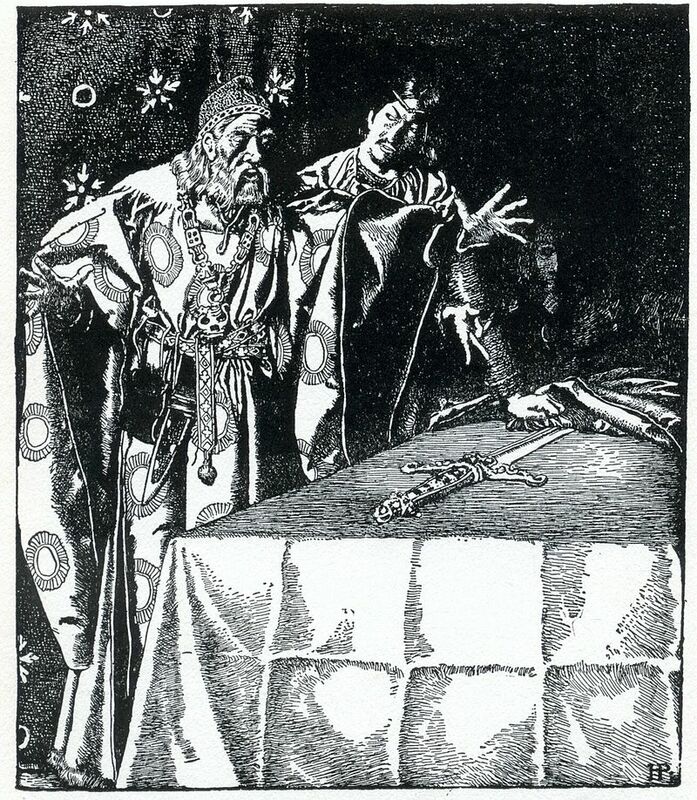 Under the name Gwalchmei he occurs in some of the earliest Welsh mythologies, and after Chrestien de Troyes picked up the story, calling the character Gawain, he became incredibly popular in French Arthurian cycles. The origin of the name is disputed. The first element is Old Welsh gwalch ‘hawk’, but the element -mei is uncertain, and the later forms of the name ending in -wain and the like perhaps show influence of Old Welsh gwyn ‘white’. In any case, Gwalchmei itself is rare outside of literature: It is the Old French influenced forms that spread around Europe. The name, perhaps influenced by Gaelic gabhann ‘of the smith’, survives today in the form Gavin; because this is the most common spelling under which the name is used today in English-speaking contexts, it is the spelling we have picked for our header name. This name was never as popular as some of the others, but it is relatively wide spread. In England and Scotland, we have a variety of English and Latin examples from the 16th C; the most common forms are Gawen and Gawyn. In unprocessed data, we have an unusual form, Gouen, in 14th C Yorkshire. On the continent, our examples are earlier: In France, we have a Latin genitive form Galweni from 1164, and a variety of Middle French forms in the 14th C, including the dialectically interesting Gauvaing. The name also moved quite far east, with Gawin, Gawinus, and Waliwan all occurring in 14th C Silesia. In Italy and Spain, the internal l was retained, as can be seen in the forms 13th-14th C Latin genitive forms Galvanei and Galvagni from Italy; Gualvanus and the diminutive Gualvaninus, two names from early 14th C Imola in our unprocessed data; and the 16th C Catalan nominative form Galvany from Valencia.